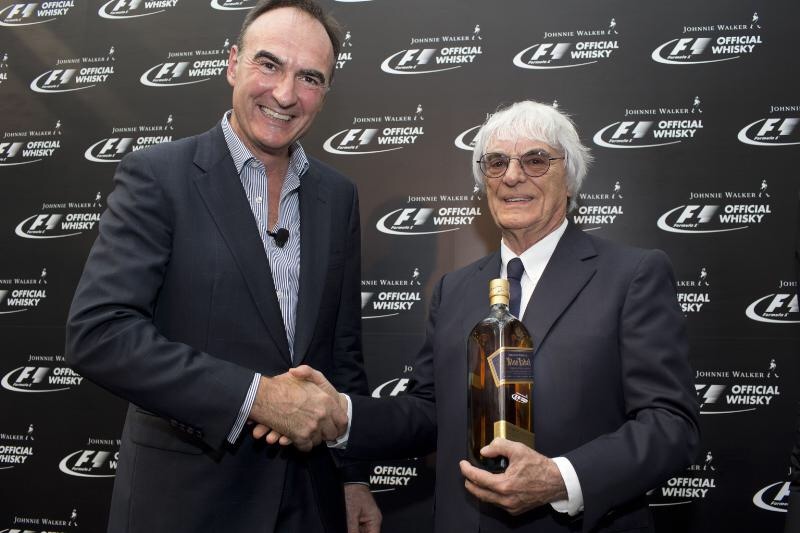 JOHNNIE WALKER(R), the world’s leading Scotch Whisky, today announced a new partnership with the Formula One group that will enhance the brand’s global positioning and significantly expand the platform for its highly successful responsible drinking initiative, Join the Pact. weekend’s 2014 FORMULA 1 SINGAPORE AIRLINES SINGAPORE GRAND PRIX at the Marina Bay street circuit. 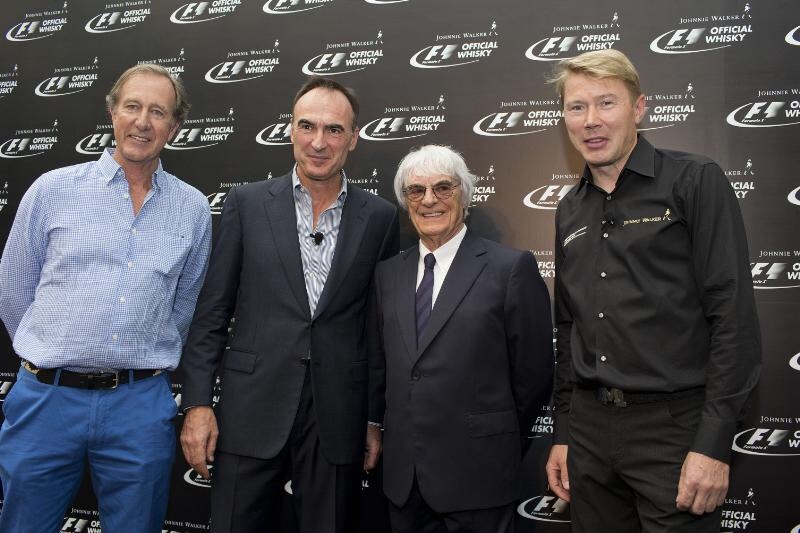 caption:	Pictured at the announcement of Johnnie Walker® as the Official Whisky of FORMULA 1 were Dr Nick Blazquez, President, Diageo Africa and Asia (second from left), with Bernie Ecclestone, Chief Executive Officer of the Formula One group, flanked by Mika Häkkinen (right), Johnnie Walker Global Responsible Drinking Ambassador, and Robbie Walker (left), a direct descendant of the brand’s founder, John Walker. Dr Blazquez said JOHNNIE WALKER, as a pioneering whisky brand with a progressive spirit, was the perfect whisky to partner with the world’s most progressive and technologically-advanced sport. The new partnership greatly strengthens the historical connections that the Walker family has with the world of motorsport and Grand Prix racing which go back to the 1950s. Building on those historic links, in 2005 JOHNNIE WALKER established a partnership with McLaren Mercedes which, over the past nine years, has enabled the brand to deliver successful marketing and responsible drinking programmes around the world. Speaking at the announcement today, Nick Blazquez said: “Becoming the Official Whisky of FORMULA 1 will enable JOHNNIE WALKER to greatly extend its reach to race fans. 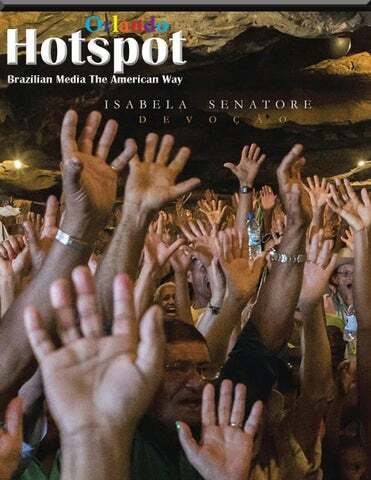 As a result of our new arrangement, we will have access to a global television audience of more than 450 million people and a track attendance audience of around 1.5 million every year. “Equally important, and a key reason for JOHNNIE WALKER to become the Official Whisky of FORMULA 1, is the huge opportunity we have through this expanded global platform to reach even more F1 fans around the world with responsible drinking messages. The new arrangement reflects historic connections between the Walker family and the world of motorsport and Grand Prix racing which goes back to the 1950s when the late Rob Walker established his own private racing team. His great-great-grandfather was John Walker who founded the whisky business in a small shop in Scotland in 1820. Moss in Argentina in 1958. Attending today’s announcement in Singapore was Rob Walker’s son, Robbie, with a collection of memorabilia from that great era of World Championship Grand Prix racing.